The seat of war in the circle of Westphalia. 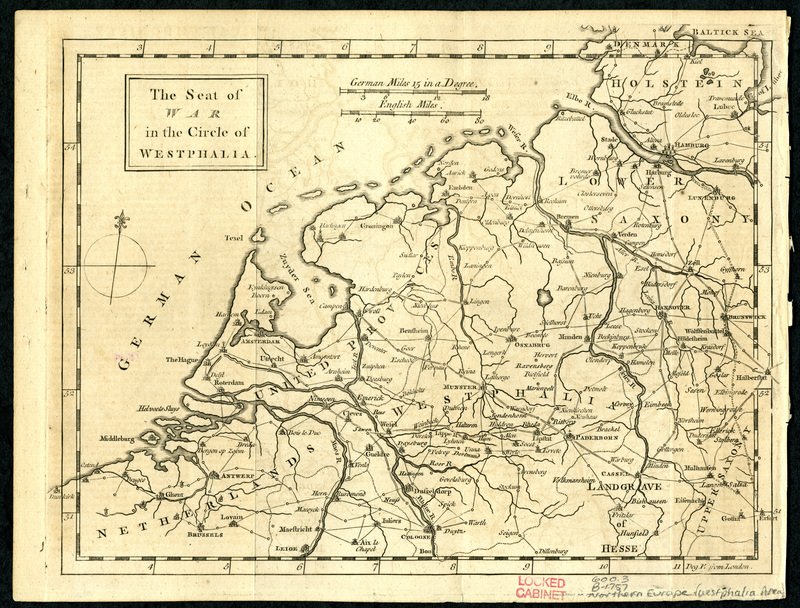 Map showing Westphalia and adjacent areas, including much of the Dutch Republic. Oriented with north to the upper right. From: Gentleman's Magazine, and Historical Chronicle, vol. 27, 1757. Detached from: The gentleman's magazine, and historical chronicle. Volume XXVII: for the year M.DCC.LVII. London: Printed for D. Henry, and R. Cave, . Map was originally published in the June 1757 issue, but may have been relocated elsewhere within bound volumes of Volume XXVII. Prime meridian: London. Scale approximately 1:2,543,400.